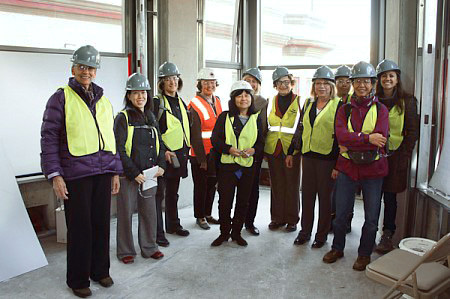 Nancy Florence, Mignon O’Young, Sherry Weller, Janet Crane, Darlene Jang, Deborah Vick, Bobbie Sue Hood, Judith Rodden, Elizabeth Cox, Margaret Chu, and Laura Reyes take a construction tour of City College of San Francisco Chinatown North Beach Campus. OWA Members will be celebrating the holidays on Saturday, December 10 from 4 to 8 PM at Mui Ho's home in Berkeley. All current members are invited to this annual Holiday Party where we come together to share good cheer and bring gifts for the Hamilton Family Center. Please click here for more information about the gift giving. Members are requested to RSVP here, so we know how much food and drink to order for a really merry time. Members, have you taken advantage of all that the OWA website has to offer you? You can increase your presence on the web by creating a portfolio of your work and maintaining a journal of your postings. You can do all of this and more yourself by logging into www.owa-usa.org. On the OWA site pages, we have randomly generated photos of members' projects from images that have been submitted for exhibitions or uploaded to their portfolios. These photos include links to member portfolio pages and to their own website. A complete catalog of member portfolios is on the Portfolios page. Our focus is to assist with marketing our members. We encourage members to submit project photos to enhance the OWA website and to increase individual member visibility on the web. OWA members may also create their own blog or journal. OWA webmaster, Bill Hocker has set up his journal page to give you an idea of how these pages might be used. The journal postings are currently visible to members only, but if you would like them to be made public, please let him know. He reminds us that these pages are in a continual state of 'beta' development and that your feedback about desired features and bugs is very important. Please contact him with suggestions or questions. This note is from Andrew Cecena, an intern writing OWA members on behalf of the San Francisco Human Rights Commission which is a department of the City and County of San Francisco. Teresa Sevilla, Gilda Peters, Suzan Swabacker, Sandra Miller, Joanne Winship, Darlene Jang, and Leslie Golden meet up for the construction tour. Aah, the constant warning beeps from the JLGs and the piercing sounds of the table saws. It sure feels like home to be walking around a construction site again! It’s been a while since I have walked around with my safety vest and hard hat, but thanks to fellow OWA member Darlene Jang of Barcelon & Jang, Architecture, I recently had the opportunity to do so while catching up with fellow members and touring her latest project under construction: the City College of San Francisco’s (CCSF) Chinatown North Beach Campus. The first OWA tour took place on November 7th. I, along with nine other OWA members, got a sneak peek into the creation of the newest high rise in the Chinatown/North Beach neighborhoods on November 9th. Each tour was led by two of the three architectural principals: Darlene Jang and Wayne Barcelon of Barcelon & Jang, Architecture, and Jennifer Devlin of EHDD Architecture. Barcelon & Jang, Architecture is a joint venture partner with EHDD Architecture in the designing of CCSF’s latest buildings which are on track to achieving LEED Gold certification and in the coordination of the design and consulting team members. The 145,000 sf campus is split into a 14 story high rise located at the corner of Kearny Street and Washington Street and a 4 story annex building located at the corner of Washington Street and Columbus Avenue. The high rise is clad in prefabricated panels and glazed curtain walls accented by horizontal metal fins. Most notably, its podium’s exterior elevations are highlighted with giant photographic murals which reference Chinese culture and lands. The main building consists of administration offices, the library, classrooms, and a multi-purpose room that opens up to a roof garden terrace. If you’re lucky enough to make it to the top floors, then you’ll be treated to breathtaking views of Telegraph Hill and the Bay beyond, as well as Chinatown, Nob Hill and beyond. The L-shaped annex building is clad in materials similar to those in the high rise building. It contains a state-of-the-art Culinary Arts and Hospitality Department, a demonstration kitchen classroom, and a multi-purpose auditorium with retractable bleachers which can make way for banquets and large events. On Columbus Avenue, the building opens up to the sidewalk and welcomes the public into the school with a ground level cafe where students can hone their culinary talents and share their hospitality skills with the community. With eight years of involvement with the CCSF project, Darlene has interfaced with the various user groups of the campus as well as the various community organizations. While it hasn’t always been easy along the way (think controversies! ), it has been very fulfilling for her to see the project arrive at where it is today. 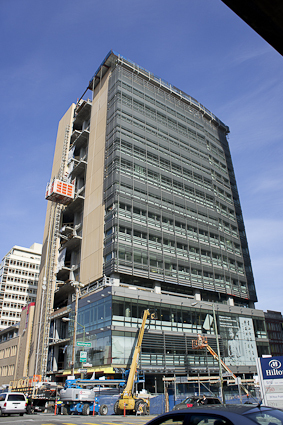 By spring of 2012, the project should be completed and available for move in. But of course, we all know that architectural projects never end at date of final completion signed off by the building department! Congratulations to Barcelon & Jang, Architecture and EHDD Architecture for creating such a beautiful building which sits nicely in the neighborhood. Article by OWA member Mignon O’Young, Founder and Editor of Green Architecture and Building Report (gabreport.com), and Principal of Mignon O’Young Consulting. The October Annual Meeting voted in four new Steering Committee members to serve the next two years. Eliza Hart, Rosemary Muller, Rachel Slonicki and Cameron White, join Susan Aitkin, Gabriella Chamu and Dede Tave to help plan and bring programs to OWA members for the year 2012. It’s a great group of women who will be focusing on increasing the visibility of women in the design profession through training and marketing. 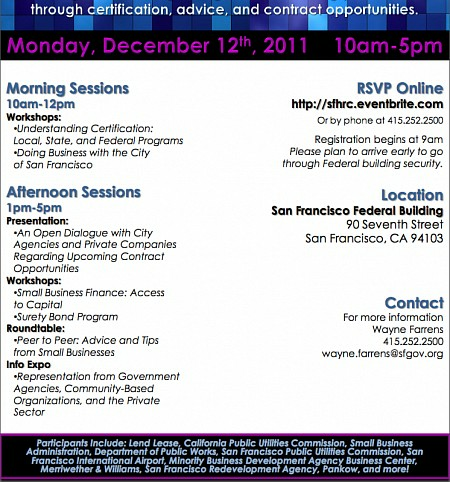 Member assistance in planning and participation in these events will be highly encouraged. The financial report was made by Treasurer Judy Rowe and a proposed 2012 Operating Budget was presented. After lengthy discussions and activity pod reports that put the proposed budget in perspective, the 2012 budget was approved. The proposed budget and approval process was initiated to encourage more information sharing and participation in the planning and implementation of activities. A special 2012-2013 budget for the 40th Anniversary of OWA was also presented and approved, giving the green light for planning a symposium and gala celebration in the Spring of 2013. Book Circle Pod - Wendy Bertrand presented a report on the 3 books read in 2010- 2011, the budget expended, and the books planned for 2012. She requested that the Steering Committee and membership decide which schools that teach architecture or design classes should receive the donated books. Members wishing to join the 2012 Book Circle should contact Wendy Bertrand. Media Pod - Leslie Golden reported on the progress of the 2 videos in production for OWA - one for the 40th anniversary gala and the other a brief promo for the website. Ecovillage Pod - Spring Friedlander would like OWA to endorse adding the number of occupants of a residence to the point system of Green Rating Standards. Business Trends Pod - Shannon Devine has been posting to the Forum on the OWA website every Monday. She would like a method of notifying members that new information is posted to Forum. Public Service Pod - Cami White & Rachel Slonicki reported on the OWA award of $1000 scholarship to an ACE student. A Mosswood Park volunteer day was attended by Cami and Judy Rowe. 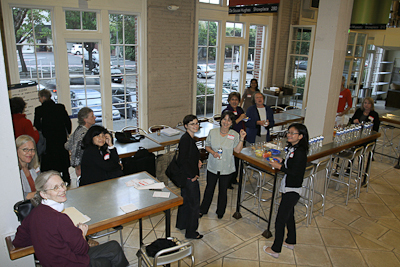 Mentorship & Scholarship Pod - Karlene Gullone wants to plan a kickoff in 2012 for linking mentors with mentees at an Academy of Art presentation. 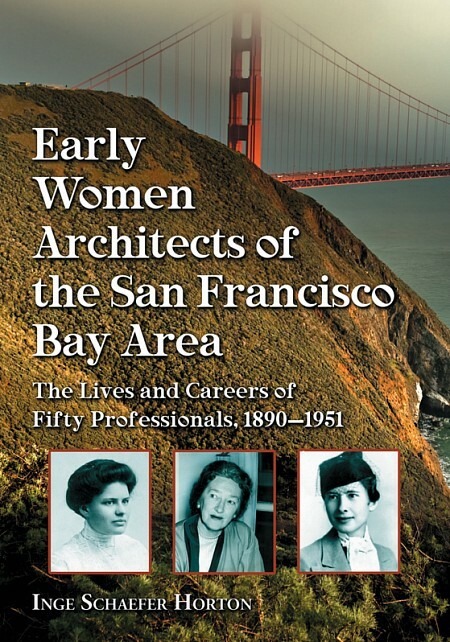 Inge S. Horton is the proud winner of the 2010 Milka Bliznakov Prize awarded by the International Archive of Women in Architecture for her book "Early Women Architects of the San Francisco Bay Area - The Lives and Work of Fifty Professionals, 1890-1951." The jury stated "This work deserves to be seen as a model for recovering those unknown histories from other places that reveal the contributions of women to the built environment. 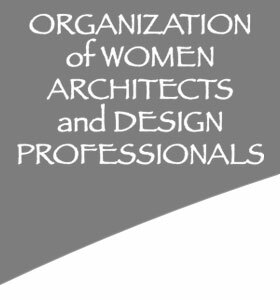 Overall, the book offers a welcome, continuing challenge to today by illuminating the manner in which women of a previous era located a creative approach to the profession." Golden Associates, Landscape Architects is delighted to announce we will be better able to serve our clients with a new Senior Associate. With over 27 years of professional experience and as the founding member of the Design Consortium, Dayle Henry was responsible for enhancing the quality of life in Ventura, CA. He is excited to be relocating to the Bay Area and continuing his work on Master Planned Communities, Streetscapes, Parks, Riparian/Creek Restoration, Habitat Restoration, Oak Preservation, Multi-family Housing Developments and High End Residential work.